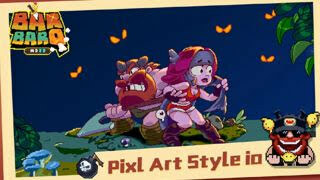 Here's some tips, tricks, and strategies for beginners playing BarbarQ, a real time multiplayer pixel art style mobile battle arena game. First Thing To Do: Collect Rewards! This game has a lot of freebies and if you can gather them all fast, you'll get stronger in no time! *Note that some quests might not become available until you reach a certain Barbarian Lvl. - Bind your account to Facebook or Google (Personal Info section) to safeguard your progress from accidental deletion or data loss for example. - You will also receive some starting Gold after binding your account (check your Mail in-game). - Check your Mail for more freebies like achievement rewards, events related, or other special rewards from the game developers. All rewards from gift codes can be redeemed here too. Complete Events and Claim Rewards! - Like any other game, just Sign-in everyday to receive rewards. - The 7 Day log-in rewards will reset and generate new rewards after completing the first set. - Should be completed every day to gain Gems, Gold, and Hallushrooms. Note that the "Spend 50 Gems" task is optional, for early game, ignore this for now and earn your Gems. - Only lasts for a week so take you time and complete these tasks as well. Complete what you can, and only get those required Skills, Characters, Pets, Footprints, and Emojis if you can merge and unlock them with Gold for now. - Purchasing the Monthly Card will also give you some nice benefits like getting 20 Gems per day (need to be online though to receive them). - Varies depending on the required resources to spend, if it's free and easy to obtain then go ahead and complete these tasks (example: Spend Hallushrooms). - Sometimes, it's better to wait for [Spending Gems] events that gives excellent deals and rewards when spending Gems. Example: Earn and spend your gems for purchasing new characters. - Watch out for Limited Events like [Celebrate] for even more rewards! - Team up and win Rank 1 in BarbarQ Arena to obtain Gold and 1 BBQ's Huge Gift that may contain Gold and Souls (once per day). - Once you are able to complete 5 BarbarQ Arena battles, you may now start to collect Keys. - Get Team Rank 1 or 2 to get a Key after the battle (also available from the Traffic-Free AI Mode). - Complete 3 Keys to open up a Chest, up to 3 times per day (refreshes at server time). - More rewards can be obtained at higher Lvls. - Excess Souls or duplicates will be converted to Gold. 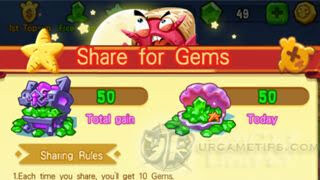 - This is the easiest way to get free Gems everyday! - Just by watching video ads will net you some free Gems (up to 50 Gems per day, 10 per share with 10 minutes interval). Purchasing the Monthly Card will shorten the interval to 5 minutes. - Note that this will not work all the time because of the limited video ads available. - You may also receive some Gold as battle rewards, until you reach the Limit. - Gold per battle can be increased by teaming up with other players or friends (up to +20%). - You'll be rewarded according to your Grade at the end of the season. - 1 Season is equal to 1 month, then it resets to Bronze II again. Rank as high as you can to receive a handful of rewards like Gold, Gems, Souls, Pet Souls, and more. Good Luck! - [Bronze II] up to [Silver I] = Aim for at least Team Rank 2 to get 1 star. No star deduction at this point. - [Gold III] up to [Gold I] = Aim for at least Team Rank 2 to get 1 star. If you end up at Team Rank 3, one star will be deducted. - [Diamond IV] up to [Dragon IV] = Aim for at least Team Rank 1 to get 1 star. If you end up at Team Rank 3, one star will be deducted. - [Dragon III] up to [Titans+] = Aim for at least Team Rank 1 to get 1 star. If you end up at Team Rank 2 or 3, one star will be deducted. - Note: If you have enough "Safety Points" (depending on your current Grade), Grade can be kept when it is about to go down. Safety Points will reset then. - Alternatively, if you use a "Star Protection Card" before the battle, you can save a star if you lose. Star Protection Cards can be obtained from events, giveaways or buy them from the Shop (optional). - An extra star will be added once you are able to reach it's maximum cap. - Medals can only be obtained from BarbarQ Arena battles. Medals from"Traffic-Free AI" and "Create Room" will not count. - Only 1 Medal can be obtained per battle, depending on your overall performance. - Reach the required number for each Medals to increase your Achievement Lvl. Each Lvl Up will net you a handful of items like Avatars, Pet Souls, and more. - These are new rewards that you can get from events, giveaways, spins, and more. All cards can be activated from your Bag. - You can use them but will expire after some time, check their time duration right before their names. - If you already have the Pet, Skill, or Character, you'll instantly get Hallushrooms instead. Use Hallushrooms to Get Spins! - Hallushrooms can be obtained from event rewards or when you buy Gold using Gems (optional). - Once you are able to obtain enough Hallushrooms (recommended 270 pieces), go and try your luck. - Note: Once you reach mid to late game, it's better to keep your shrooms if most of the items offered are no longer useful to you, better wait for the next refresh. 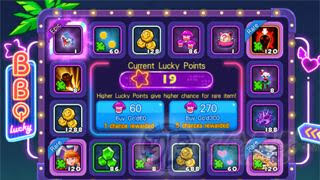 - Each spin will give you Lucky Points which will help increase your luck of getting Rare and Epic rewards. Once it reaches 200 Lucky Points, Epic rewards will be granted 100%. - Note that once you are able to obtain an Epic reward, your Lucky Points will reset to 0. Other Non in-Game Events and Rewards! - Check their Official Facebook Fan Page and Community too to find exciting events and gift code giveaways! - To redeem your Gift Codes, enter the given code under the "Settings" Menu in-game, then check your Mail for the rewards. - Don't forget to include your Player ID available from your Personal Info (click on your Avatar) and the country you are from. How to Level Up Your Barbarian Lvl! - The main benefits of leveling up is to increase your character's stats and to get higher rewards from Arena Chests and Level Chests. You can also unlock new features once you reach higher lvls. - Go to your "Collections" and Unlock or Merge any items here, preferably Skills and Pets. Go for Footprint or Emoji if you just need a bit of Exp to level up. - Collect Skills, Pets, Footprints, Emojis, or Souls from various events, then merge or unlock them using Gold. Items that can only be unlocked with Gems will not give you Exp. - Complete all Main Quests and Daily Tasks, to get EXP points. - This is where you can allocate your Skill Points to any stats that you like, depending on your play style or role (example: Attacker or Support). - You may reset your stats or abilities once per day. - This is a new feature where you can increase the stats of your characters, and unlock their special skill and visual effects. - Needed when awakening heroes. - Awakening items cab be obtained from limited events (free or exchange with Gold), or buy from the Shop. - When the Awaken attempt fails, the Awaken level will likely degrade (somewhere around 50% chance?). Best Ways to Spend Gold! - Mostly for Merging and Unlocking Collections, to get EXP for Leveling up asap. - Use to farm "Roast Chickens" from "Dark Adventure", then buy Pet Souls that you like from the Shop. - Used for upgrading your favorite Pets to increase their effectiveness (slots). - Exchange them with Awaken Gifts to get Awakening Items (limited event). - Use your excess Gold to buy Souls from the "Mush Room" or "Gold House", buy what you don't have. Best Ways to Spend Gems! - Yes, even if you don't have any plans on using them, still unlock them all because you'll need them for certain events to get freebies like Gems! - If possible, buy when they are under a discounted price. - Gem only Pets, Footprints and Emojis are also some of the requirements that you might need to complete other limited events, but only buy them though if the rewards are really worth it or at least you can gain back some of your Gems. - I would recommend buying "H-Pet Upgrade Boxes" if you need fast Gold for leveling up, earn your Dracoins for upgrading your Holy Pets later on. It costs 50 Gems too, so this will also cover your Daily Event task, even better if there is a Gem Spending Event available with attractive rewards. - For your extra Gems, you might also want to consider buying Pet Boxes here for late game completion. - Any items that you need, like Awakening Items. - You can buy 60 Gold and 1 Spin here for 60 Gems if you like (optional). - Click on the [+] next to your Gold Total. - You'll spend 10 Gems to enter a 1 vs 1 battle. If you win, you can take your gems back with extra Gold and Gems, but if you lose, you will only get some Gold. - Go for it if you are confident enough and have extra gems. - Check the events section's [Spending Gems] offers for even more rewards. If the deal is really good, then this is the best time to spend Gems. - Example: [Spending Gems] events that gives Gems, or items that are not easy to obtain. Join or Create a Guild! - Creation and Expansion requires a number of Gems. - The biggest scale of a guild can be 100 players, don't forget to sign-in to your guild too. - Your guild will have an exclusive guild chat channel, guild rank and guild rewards. - You can obtain guild EXP or activity points through battling, and teaming up with guild members will increase it further. - Can be used to increase Guild Lvl. - Every week, you can gain Gold rewards depending on your performance. - Exchange via Events section for various items in the game. - Obtained by teaming up with guild members and reaching at least Rank 2 in BarbarQ Arena or Dark Adventure. Beginner's Battle Strategies, FAQs, Tips, and Guide!